AcouSticks weekly practice is usually on a Sunday at one of our homes and we generally work on a few pieces for fun or on items for upcoming gigs. Due to work constraints, we don't have a performance gig this month and are therefore exploring other music that appeals to us. Something we have always wanted to do is join forces with other musicians and this past weekend was a treat! We enjoyed playing with guitarist/ lutenist Ben Moors . . . . and the sound of the 3 recorders with the basso continuo part played on the lute was beautiful. Here's a little video from our practice of us playing Tourdion (aka "Quand Je Bois Du Vin Claret"). Seen in the video are Ben Moors (lute) and Jennifer (alto recorder) . . . . heard but not seen are Anne (tenor recorder) and yours truly, Laurie (sopranino). Welcome to the brand new Acousticks Recorder Consort blog page. We hope to be able to share upcoming events, tips and tricks we learned along the way and exciting recorder news in general. 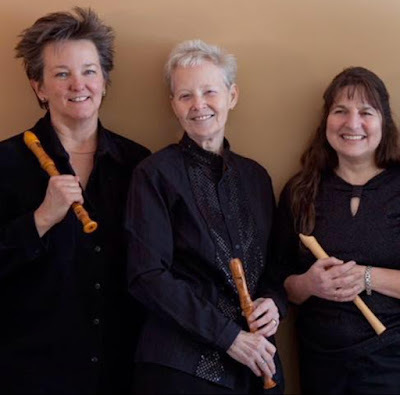 Acousticks Recorder Consort (ARC) consists of three members: Anne Hess, Jennifer Weaver and Laurie Meyers. All of us have played recorders for a number of years separately and joined together to play as ARC ten years ago and are based out of the Bangor Maine area. We look forward to having you follow along on our musical journey.